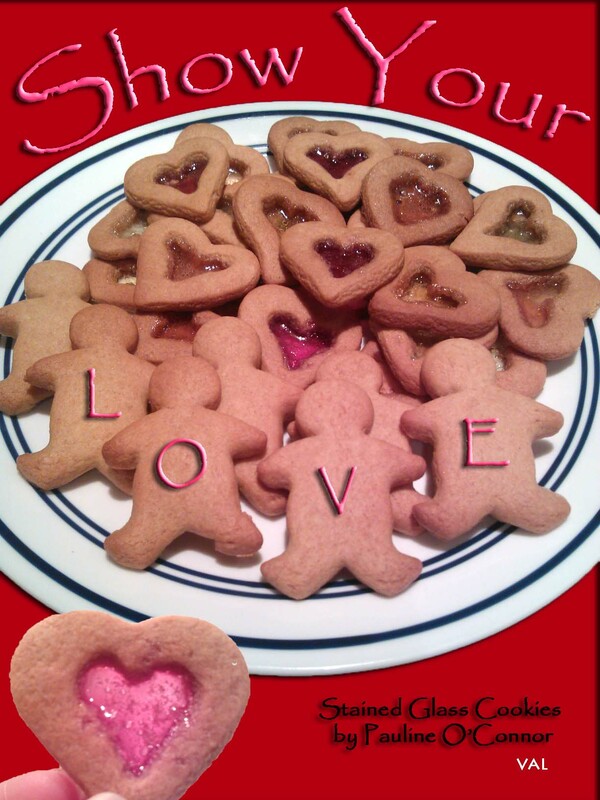 In the whirlwind of all that revolves around love, Valentine’s Day has come and gone in a whiff, but love and relationships are here to stay with us all through the year. No matter what people think of Valentine’s Day, we hope it serves itself well in reminding the world that what it needs is LOVE, sweet LOVE. There is a terrible hunger for love. We all experience that in our lives–the pain, the loneliness. We must have the courage to recognize it. The poor you may have right in your own family. Find them. Love them . And, while we are on the subject, here is an article Give and Take (June 2006) on Suzanne published in STAR 2. We are grateful for the love we have from our family and friends, and from the good Lord. Amen. As we all know, in Malaysia (or most of Asia), life is focused on good food – as some might say, it is a ‘national pastime’. In Penang especially, people rave about the variety and quality of the local hawker fare. Happily, there is always something positively abuzz in our home and most of it revolves around food! Naturally, the heart of the home and the hub of activity is in Mary’s Kitchen, where her culinary expertise has won hearts (and tum-tums) far and wide. 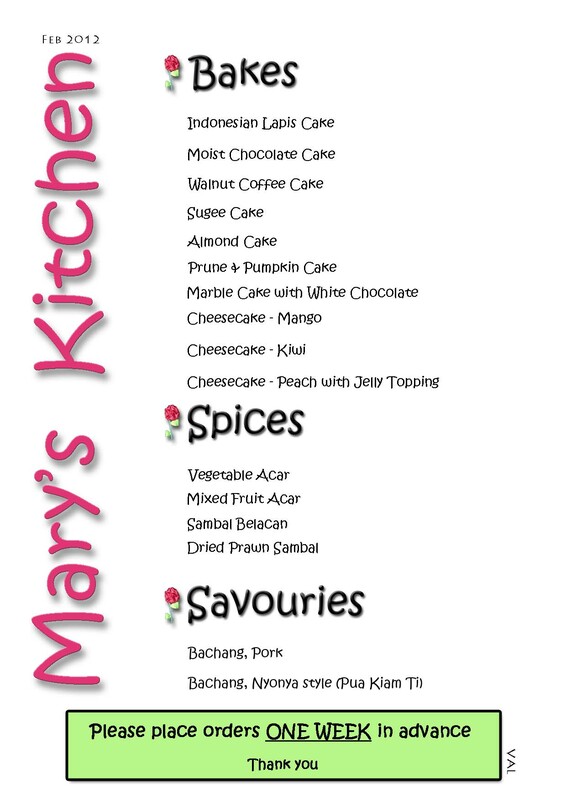 Orders come in frequently for Mary’s Kitchen specialities which make up quite a list. However, to share with all who made enquiries through our blog, here is a summary of ‘the top favourites’. We thank the good Lord for all our blessings. Since the Fit As A Fiddle story in Star2, several enquiries have come in, about how I brush my hair. So for everyone’s information, here is a short explanation with pictorial for easy understanding. I have never dyed my hair and do not use any fancy lotions or potions. All through the years, for as long as I can remember, I have been brushing my hair with 100 strokes in the morning upon waking up, and another 100 strokes before going to bed at night. No special brushes for me either…..as you can see, I use these simple plastic brushes (which one might use to brush one’s hair with, while shampooing under the shower). With one brush in each hand, I start to brush 50 strokes to cover the whole head – from the front edge of my scalp, backwards, right till the ends of my hair. As my hair is very short, my brush strokes end at about the edge of my scalp. Thereafter, I bend my head forward a little, to let my hair brush downwards easily. 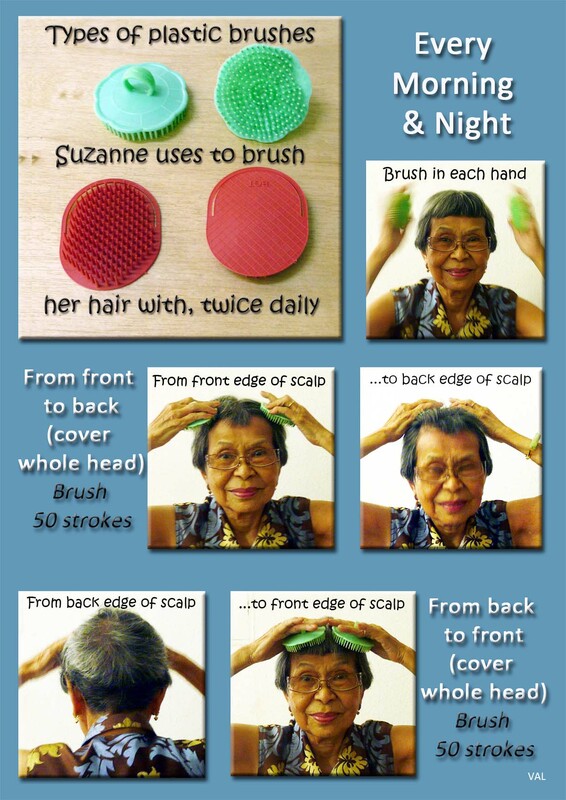 With a brush in each hand, I start at the base of my head, brushing 50 strokes forward till the ends of my hair. There is a lot said and written about the benefits of ‘100 brush strokes of your hair daily’, but whatever anyone says, I take it as an ‘exercise for the scalp’. After each brushing, my scalp tingles – as the blood circulation has been stirred into motion. I think it has helped in keeping my grey hair at bay over the years. You might say I was a late bloomer with the greying of my hair. Even now, my hair is not completely white yet. With the 15-day observance of the Lunar New Year coming to an end on Monday, Chinese communities the world over will celebrate the occasion with different levels of merry-making. In Malaysia and Singapore, it is also referred to as Chap Goh Meh – which amongst other things, also happens to be my birthday according to the Lunar calendar! Although I do not celebrate this Chinese birthday, it brings back a mixed bag of memories from my childhood. Being so young, the thrill of watching the fire crackers creating a mighty din outside the house, was the ‘highlight’ of the evening. When the long lines of fired crackers which lined the roads and hung from 2nd storey house windows left clouds of choking, low-lying smoke, children would then come out to light up the hazy streets with their candle-lit paper lanterns of every colourful description. As I was not allowed to fire the crackers, my cousin Stella (who was my age, and not quite old enough to join the hundreds of orange-throwing maidens out on the lake-front) and I decided to have some fun of our own. 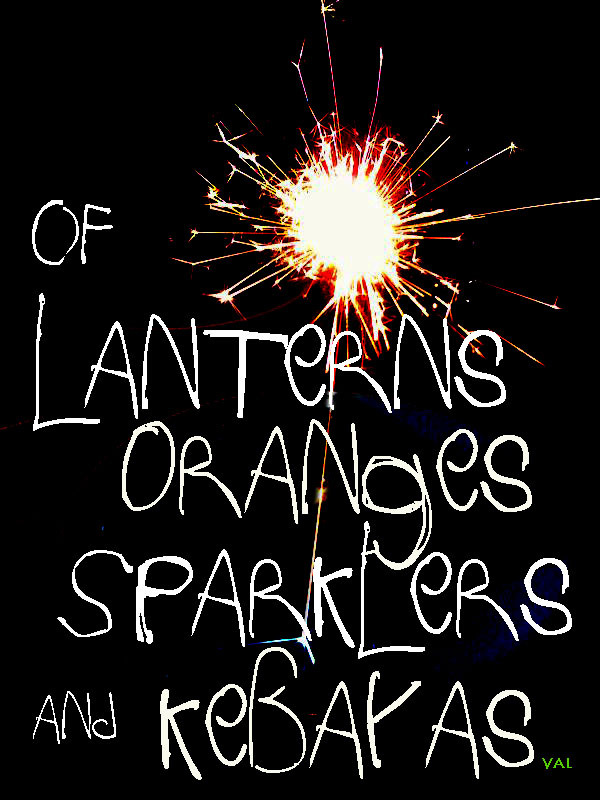 Being the bright spark that I thought I was, I got my hands on a couple of sparklers, which we lit, and danced around in our own little space, downstairs. Gleefully dizzy with our own revelry, and prancing around to abandon in the downstairs hall, a spark one too many had caught onto my grandmother’s long kebaya hanging on the wall and whooom, it was on fire before we could say ‘jack in the box’! With that, I shall leave to your vivid imagination, the conclusion of that chapter. Whether we are throwing an orange or two into the nearest waterfront hoping for a wish to come true or celebrating in any of the other customary ways, let us all pray for peace in the world. Today, the phone rang incessantly from morning till late night. Our cyberworld reverberated with chats, posts and emails, and the house had streams of visitors (more than usual). Why? All because my lovely wife Suzanne, was profiled in a 3-page feature in the STAR newspaper’s STAR 2 section, entitled Fit As A Fiddle. Naturally, we enjoyed being ‘celebrities for a day’ and are most appreciative to all at Star for their generous coverage on what makes our world go round. We just hope that their avid readers found the article inspiring. For those who did not see it, here is the link to their online story. Suzanne and I take this opportunity to thank one and all for their interest and good wishes.